Operation-wise, this isn't the slickest model, but the sound on DAB is fine. FM suffers from residual noise and a slight degree of veiling, but the basic resentation is lively and bass is notably strong and assured. 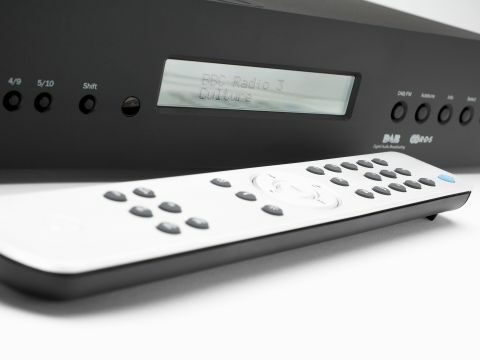 Cambridge Audio has plenty of previous experience with DAB tuners, with two older models (the DAB300 and DAB500) still included in its catalogue. Sadly, this only serves to highlight one unfortunate feature of the 640T V2. Whereas the older models used the 'push and press' tuning-knob approach common to a great many DAB tuners, this new one requires the user to find stations using push buttons - you use the left and right arrow buttons to find a station, then another button to tune in, which is a right pain, frankly. Still, we aren't going to rubbish the unit for one minor annoyance, and it's offset by such positives as a smart, slimline case and the presence of 'Natural Contour Technology', which is essentially a tone control with two positions besides 'flat', one a little brighter and one a little mellower. We reckon you'd need very bright tastes to use the former, but the latter's no bad thing. Other features include alarm and snooze functions. Surprisingly, there's no provision for using DAB's Dynamic Range Control (it's always off), and we wouldn't have minded an error-rate display rather than the less useful signal-strength indicator. Inside the 640, a single module handles DAB and FM. It actually has a Cambridge Audio badge on it, though it looks a little reminiscent of a RadioScape module. It does the usual job via the usual connectors and passes digital audio to a Wolfson D/A converter. The main audio board boasts decent-quality, no-nonsense components, and it all looks very solid, with a decent-sized toroidal transformer. Leaving NCT out of the equation in order to ensure a fair comparison with the other tuners in the test, this is a likeable model, especially with DAB. It has a relaxed yet informative sound, while the unavoidable artefacts of DAB transmission aren't accentuated. Imaging and detail are about as good as you're going to get without attaching an expensive DAC to a tuner's digital output, and there aren't any obvious whistles or other nasties in evidence. With FM, performance is mixed. It's pretty good with speech and seems fond of lively, busy music, which benefits from an appealingly 'boppy' presentation, but there's an issue with detail when one listens to a carefully nurtured broadcast on Radio 3 or anything else with dynamic range. Noise seems subjectively only a shade higher than with the quietest tuners around, but the general sense is of quiet sounds struggling to escape from a rather murky background. That's a shame, because the tonal qualities of the tuner are decent, with a powerfully extended bass that still has plenty of control, natural midrange and treble that's extended without being over-bright. Loud music is also well served: FM tuners often suffer congestion at high levels due to rapidly increasing distortion, but here the effect is minimal. As with the Arcam, then, the preference is generally for pop music over classical, though for some reason this model seems less confident with jazz sounds - so many jazz tracks employ wire brushes on cymbals, and the 640 makes that particular sound rather indistinct. All the same, with its modest price tag, this tuner has its attractions - as long as you control it mostly from the remote! Viewed primarily as a DAB model, it's hard to beat.